Pan seared fresh Japanese langoustine with cabbage-stuffed tortellini from Ta Vie 旅, Hong Kong - possibly the freshest langoustine I have ever had, cooked very simply. House made pasta with "aonori" sauce topped with premium uni from Ta Vie 旅, Hong Kong - another dish where Chef Hideaki Sato just presented something simple and let the ingredients shine. It's only a couple of mouthfuls, but what a glorious mouthful! Crab meat omelet (ไข่เจียวปู) from Raan Jay Fai (ร้านเจ๊ไฟ), Bangkok - a simple omelet slowly and meticulously cooked over charcoal by a lady wearing googles and Wellington boots. Cutting it open reveals the reason behind the seemingly ridiculous price - the amount of sweet crab meat stuffed inside. Aveyron lamb 'blanc de blanc': cutlet milk poached then caramelized with buckwheat and Parmesan Reggiano cooked like a risotto, raw sunchoke and black winter truffles from Amber, Hong Kong - just the most beautiful and succulent baby lamb, with plenty of black truffle. Hokkaido sea urchin: in a lobster jell-O with cauliflower, caviar, and crispy seaweed waffles from Amber, Hong Kong - what else can be said about this iconic dish, which has been retired from Amber and now can only be found at In Situ? It inspired my Occupy Amber campaign, which actually got a mention at the 2016 awards ceremony for the World's 50 Best Restaurants despite failing miserably. Just one of the most perfect dishes I have ever come across. Slow cooked egg with potato smoothie Parmesan and onion from The Tasting Room, Macau - incredibly rich and sinful. 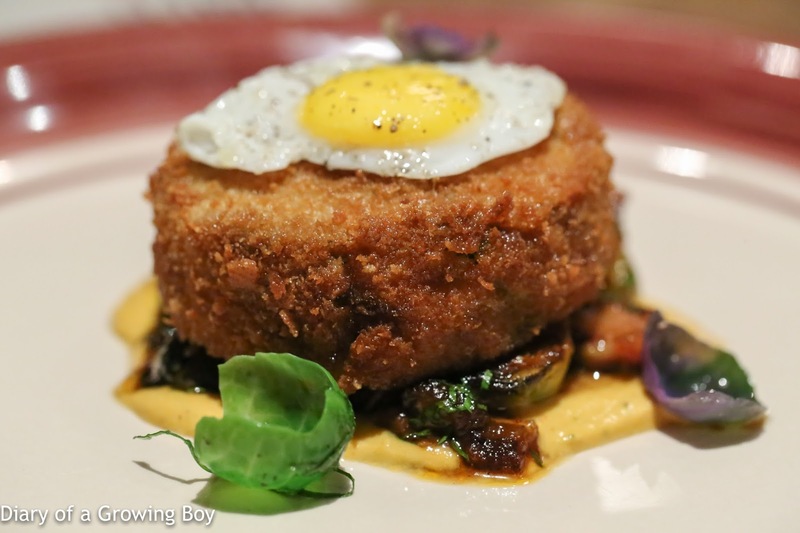 Satisfying comfort food in a fine dining restaurant. Almost a meal in itself. Jade Dragon prime-cut barbecue Iberico pork pluma (譽瓏蜜汁西班牙黑豚叉燒) from Jade Dragon (譽瓏軒), Macau - simply the best char siu ever... beating all my previous favorites. Pyrénées spring lamb shoulder / morel / rice from Neighborhood, Hong Kong - I love lamb, and Chef David Lai knows how to make me happy by drenching it with creamy sauce over a bed of rice. Sweet corn puffed mousse with aburi botan shrimp in shrimp consommé jelly from Ta Vie 旅, Hong Kong - simply one of the best dishes being served in Hong Kong, achieving perfect balance between sweetness and umami, as well as a contrast in textures. 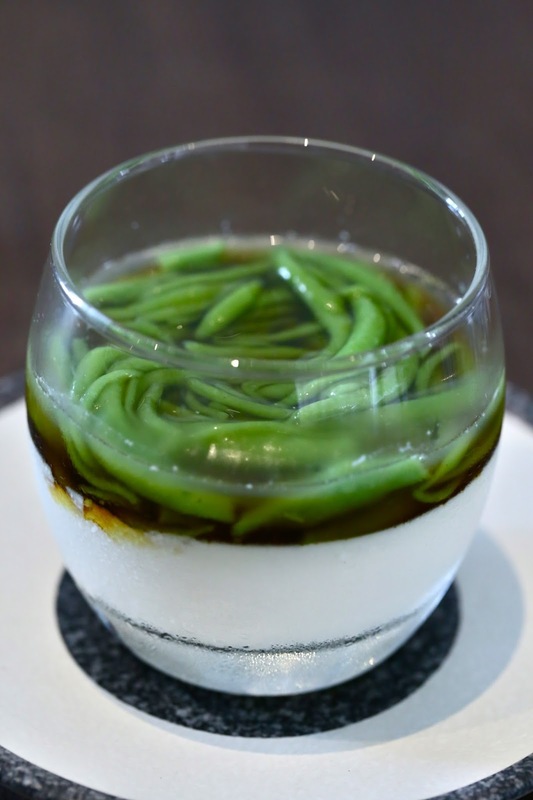 Chendol Cream from Candlenut, Singapore - I love chendol, and this remains one of the most perfect desserts I have ever had. 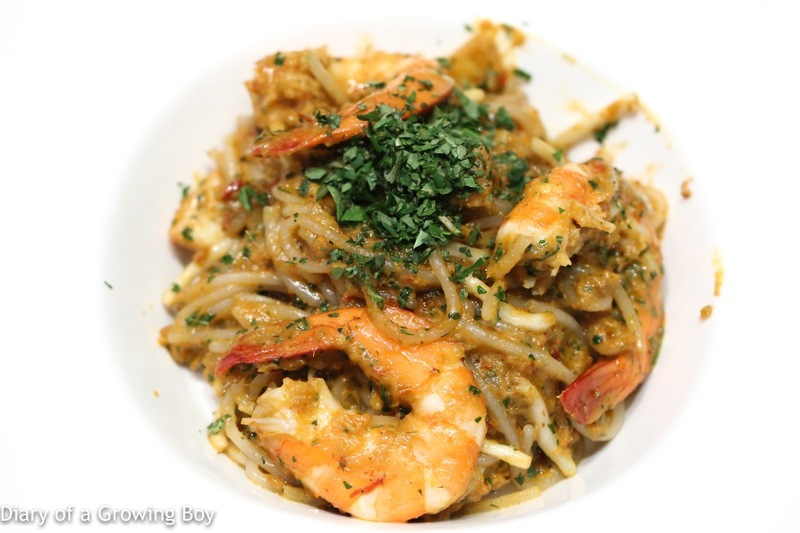 "Singapore noodles" spaghettini with king prawn from Wild Rocket, Singapore - soooo much umami, so tasty and comforting. Suckling pig filled with fried rice and preserved meat (原隻乳豬焗飯) from The Eight (8餐廳), Macau - crispy, fatty suckling pig crackling stuffed with delicious fried rice inside. It doesn't get more glorious than this. Nymphéas from Le Moût, Taichung - one of the most elegant and balanced desserts, and incredibly refreshing in summer. Beef, tongue, cracker from RAW, Taipei - incredibly satisfying comfort food that pushed all the right buttons for me. Braised stuffed sea cucumber (海參鑲肉) from mom - can't not mention at least one of mom's dishes in this list. This one is from our cooking lesson at my place, and is mom's own creation. I count my blessings every time I get to eat something like this from mom. Langoustine 'dim sum', pumpkin, passion fruit, and cacao from the Hong Kong Jockey Club's guest chef dinner with Gert de Mangeleer from Hertog Jan, Zedelgem - definitely one of my very top dishes in 2016. I have been a fan of Gert de Mangeleer since I first tasted his cuisine in 2015, and this dish is a perfect illustration. Abalone, liver, rice (蝦夷鮑 鮑肝 米) from Godenya (ごでんや), Hong Kong - a beautiful dish fusing Japanese and Italian flavors. 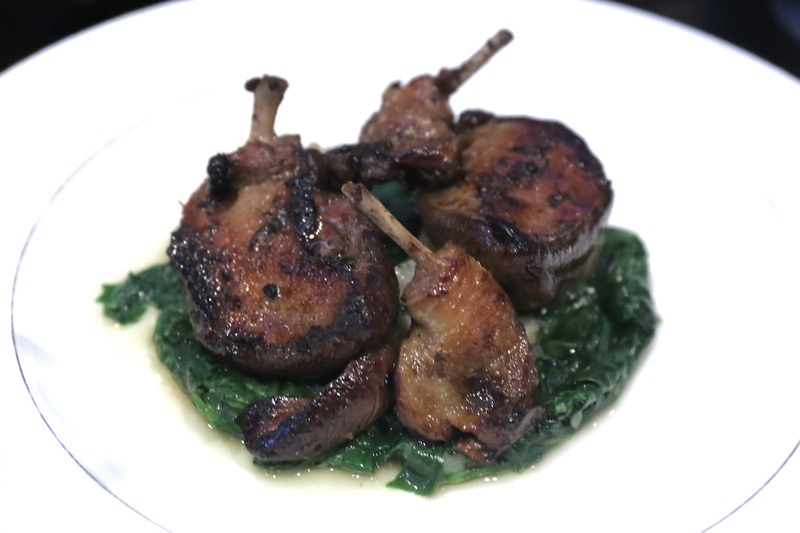 Roasted pigeon, artichokes, baby spinach and lemon chutney from ON Dining Kitchen and Lounge, Hong Kong - when I first tasted this dish, my preview for the South China Morning Post said that this was the best pigeon in Hong Kong. I still think it is the case today. Braised deer tail (红烧鹿尾) from Family Li Imperial Cuisine (厲家菜), Beijing - my first time having deer tail, and I absolutely loved it. 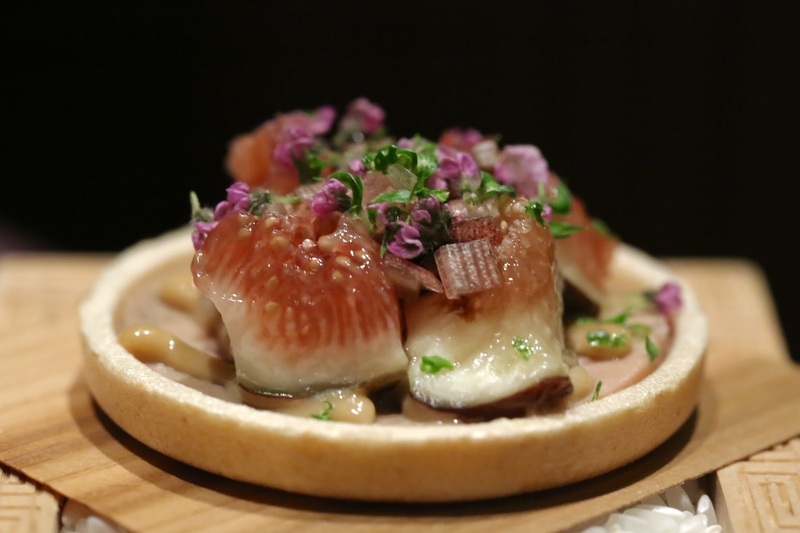 Premium foie gras served with fresh figs, sesame cream sauce and wafer (イチジクとフォアグラの最中) from Tenku RyuGin (天空龍吟), Hong Kong - a dish that is both beautifully balanced in terms of flavors as well as exquisite to behold. Certainly one of the best dishes I have had from the RyuGin stable. 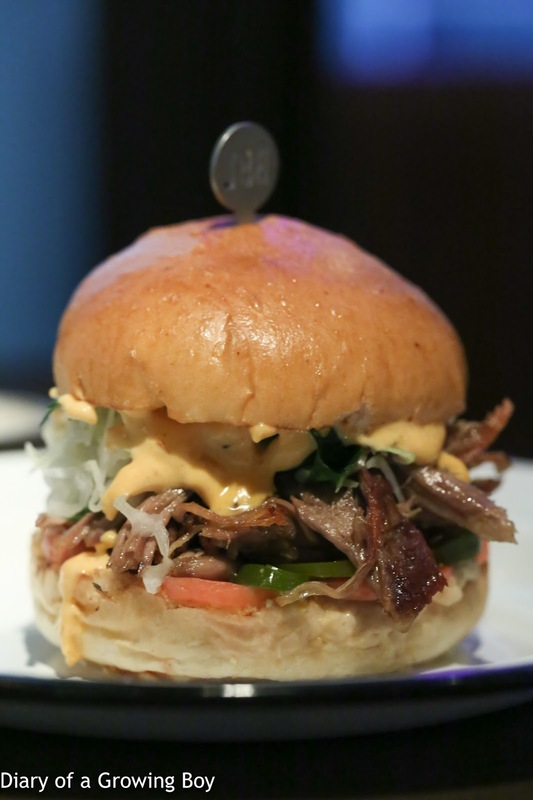 Lambo from Beef and Liberty, Hong Kong - undoubtedly my favorite burger of 2016. Everything about this - from the lamb shoulder to the slaw - just sang to me. 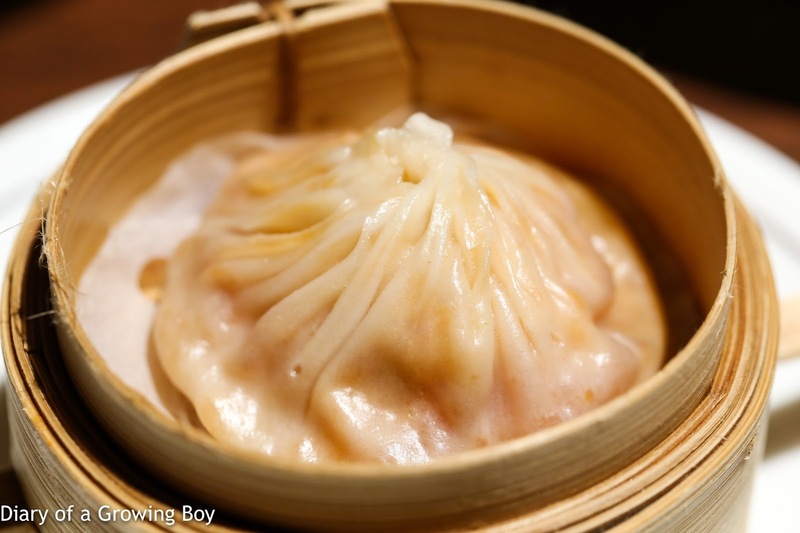 Steamed Sicilian shrimp and minced pork dumpling (紅蝦小籠包) from Spring Moon (嘉麟樓), Hong Kong - I've had xiaolongbaos with black truffle and of course with hairy crab roe, but this was damn good! Crispy "nose to tail" terrine, pigs ear bacon and 'nduja’ from Linguini Fini, Hong Kong - another rich and sinful dish that just hit all the right spots for me. 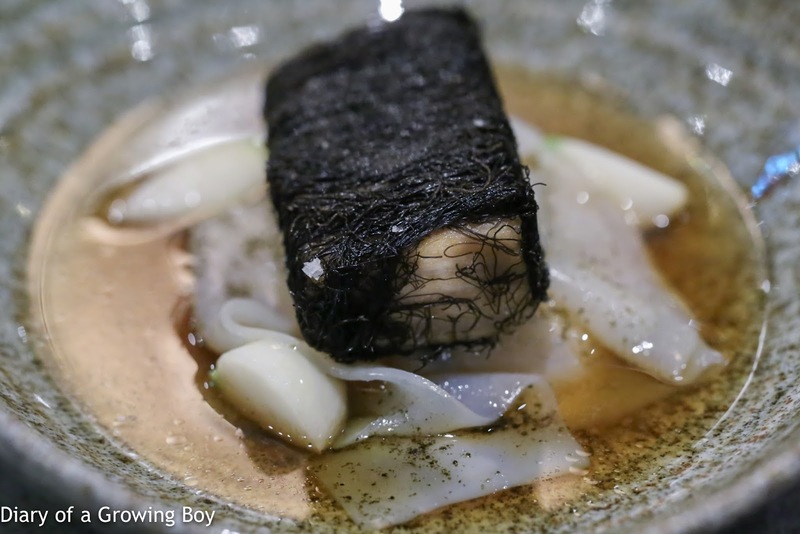 Roasted Mangalica pork jowl, scallop silk, white turnip cream, cabbage stem, black moss, aromatic pork broth from Whitegrass, Singapore - very creative use of hair moss to encase some really fatty and delicious pork. Dry laksa from National Kitchen by Violet Oon, Singapore - this has always been one of my favorite dishes in Singapore, and it's as good as ever. 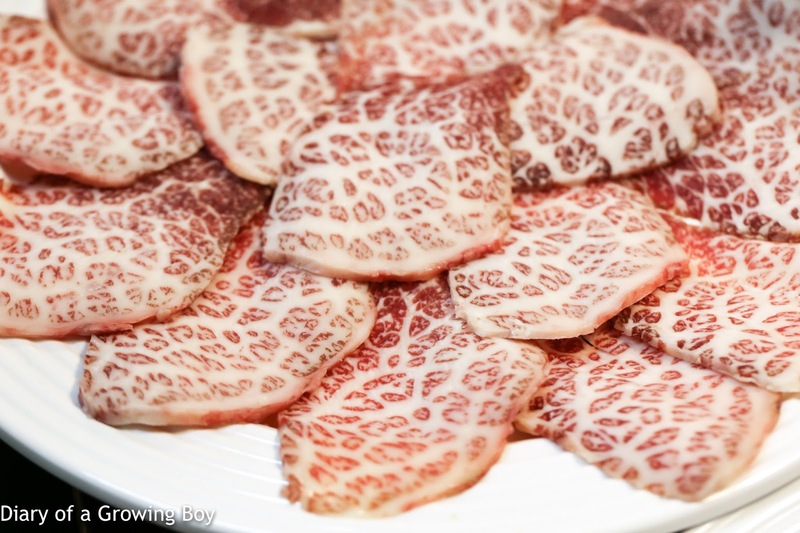 Beef hump (牛駝峰) from a restaurant in New Territories, Hong Kong - technically there wasn't any cooking involved by the restaurant as this was part of our hotpot, but this was my first time tasting the hump on the back of an Asian cow, and the marbling was simply amazing. 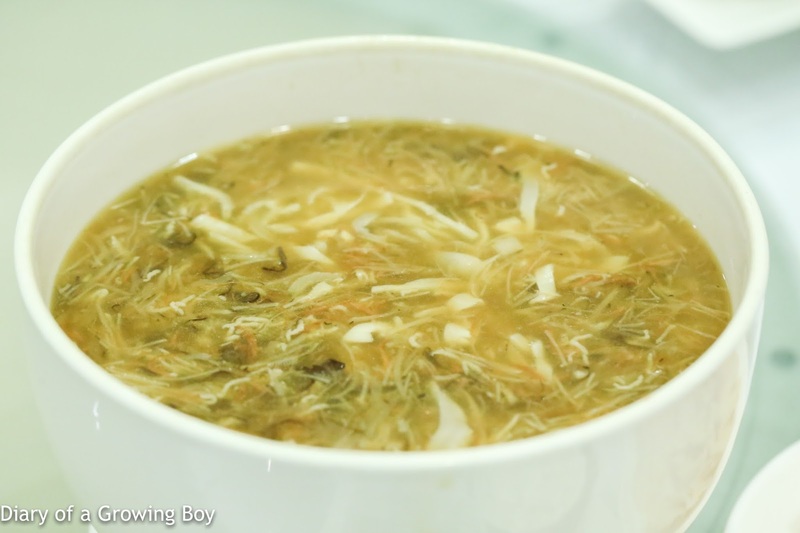 Imperial scholar's five-snake soup (太史五蛇羹) from a private dining facility in Hong Kong - for me, there simply isn't a better snake soup elsewhere in Hong Kong or Macau. Such a privilege to be able to taste this. Pizza tartufo bianco, mozzarella, taleggio and Alba white truffle from CIAK in the Kitchen, Hong Kong - what's not to like about a pizza that costs USD 300 and is shaved full of white truffle on top? Bánh mì from Bánh Mì Huỳnh Hoa, Ho Chi Minh City - the best bánh mì I've ever had, by far. Sooooo good that I bought an extra one to eat on my flight instead of airplane food. That comes to 31 dishes. Now if I could rotate these and have one of these a day, repeated 12 times throughout the year, that'd be a pretty fantastic year, wouldn't it? !